Joshua Taylor was a portrait painter born at Charlton in south London in 1812. He died 22 March 1886 at Florence Villa, Prospect Rd., St Albans, aged 74, occupation artist. Census records through 1881 give his occupation as portrait painter, portrait and landscape painter, and painter in oils and water. He died 22 March 1886 at Florence Villa, Prospect Rd., St Albans, aged 74, occupation artist. Note: Joshua Taylor should not be confused with Josiah Taylor, a more or less contemporary painter (1819-1877) of marine subjects, including the 1857 cable fleet. Some art references incorrectly conflate the two artists. The oil painting by Joshua Taylor shown below, owned by site visitor John Barnard, has an interesting connection to the cable industry. S.W. Silver & Company, which began in the 18th Century as Colonial and Army agents, clothiers and outfitters, principally to those in the Army and Colonial Service, as well as acting as shipping agents for such people travelling overseas. When Charles Mackintosh introduced waterproof clothing, Silver set up a factory at Greenwich to make similar garments. Later this expanded to include insulated wires and cables. 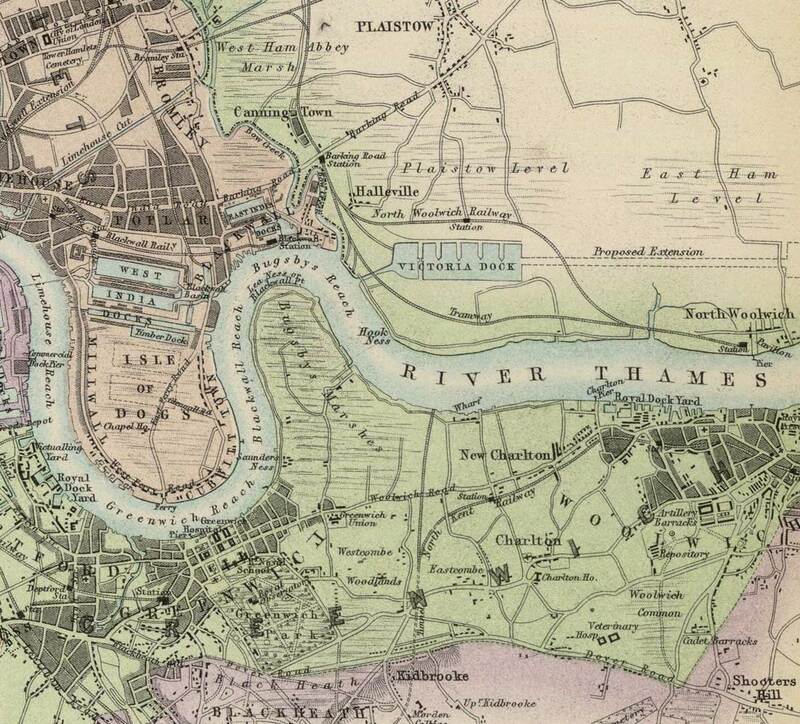 In 1852 the factory moved to Woolwich Reach on the north bank of the Thames. The factory continued to expand, employing most of the local population, and the area became known as Silvertown, a name that still exists today. In the early 1860s the firm decided to enter the field of submarine cable manufacture, and to finance this venture the India Rubber, Gutta Percha and Telegraph Works Company (IRGP) was established at the same location. This painting by Joshua Taylor, titled The Frozen Thames Taken from the Site of Siemens Factory, shows Silver’s factory in the distance, on the far bank of the river. Despite its title, when the painting was made in 1855 the Siemens factory had not yet been built, and S.W. Silver & Company were still making rubber goods. 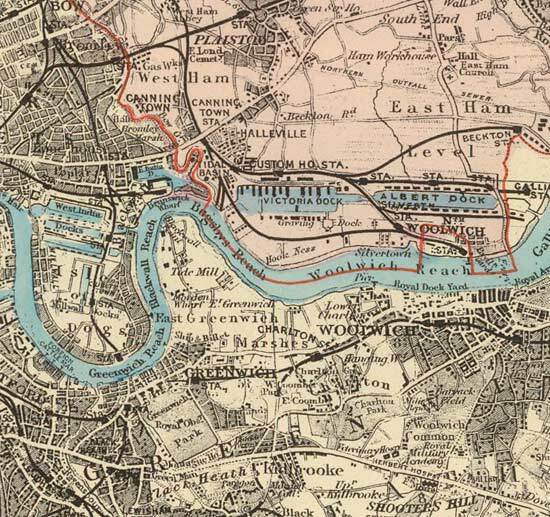 A detailed description of the development of the area is given in Archer Crouch’s book on Silvertown, published in 1900. It is believed that the title was added later, when the location of the Siemens property would have been a well-known landmark. 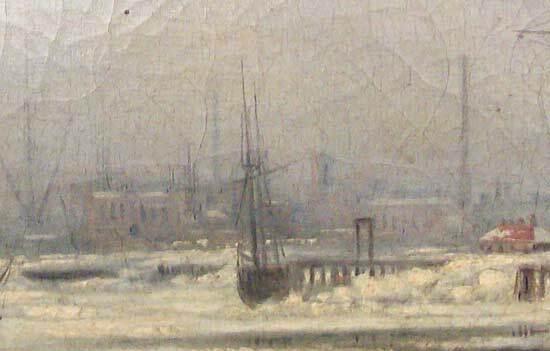 Oil on canvas, dated 1855, 16" x 20"
Marked on reverse: "Joshua Taylor No.2"
The painting shows the view from Woolwich across to the north bank of the Thames, the Silvertown factory in the distance. Compare the building with the one shown in the engraving below. 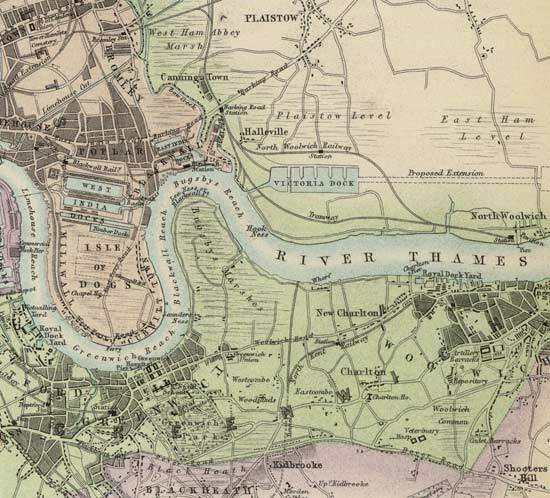 See the period and present-day maps of London, below, for the locations of the two factories. This is the provenance of the painting, which came down in the family to John Barnard: Joshua Taylor was the uncle of Thomas Taylor; Thomas was Len Taylor’s father; Len was John Barnard’s mother’s stepfather. When Len Taylor died in the 1960s, John Barnard’s younger self saved the painting, contrary to the wishes of his father who wanted to ditch it. Prior to its rescue, it had been in a room in his Grandfather’s house in Rochester lit by gas lamps and heated by coal fires. TAYLOR, Joshua, 5 Waterloo Terrace, Wellington Street, Islington. THE FROST, THE WEATHER AND THE PARKS. On Saturday a number of sleighs were driven on the ice; but on account of the vast number of persons there, and the fear of the masses congregating to one spot, it was considered dangerous, and was prohibited. In St. James's-park the number of sliders and skaters was very great; during the day, upwards of forty persons met with accidents from falls—principally cut eyes and contusions. On the Long Water and Round Pond thousands of persons amused themselves on the ice, many of the gentlemen belonging to the Royal Skating Club being present, but no accident of a serious nature occurred. In the Regent's-park an enormous number of sliders and skaters availed them­selves of the solidity of the ice. 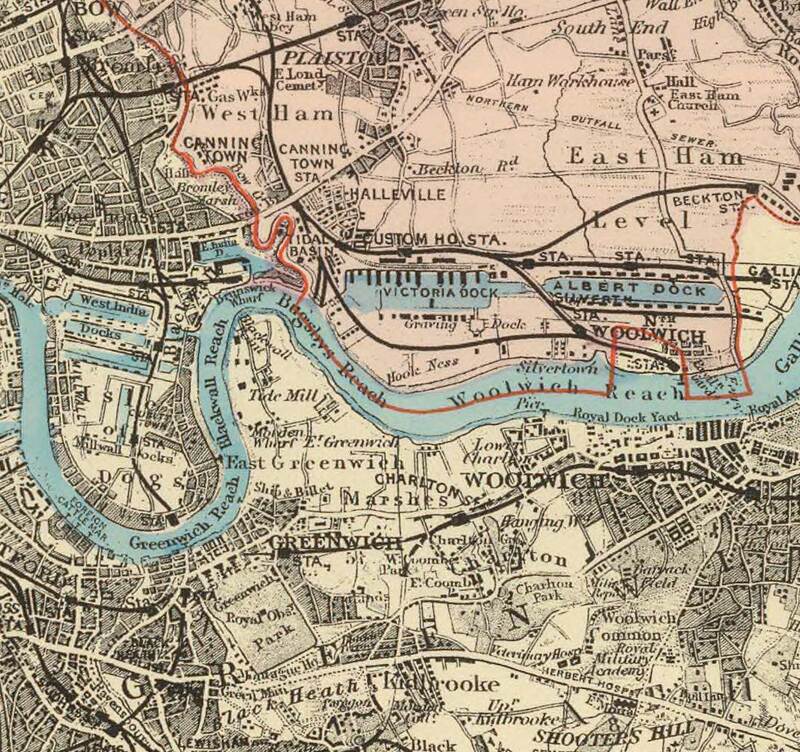 The Regent's-canal and Surrey-canal, and other open waters, now icebound, round the metropolis, all had their quota. On Sunday, owing to the extraordinary fineness of the weather, an enormous number of persons congregated on the Serpentine, in St. James's-park, and in Kensington-gardens. Numerous accidents took place during the day: no less than six persons fractured their limbs, and upwards of thirty received severe contusions and bruises on the face and head. They received prompt attendance at the Receiving-house of the Royal Humane Society. On Monday morning much excitement was produced in Hyde-park by the appearance of the Queen and Prince Albert, with the Princess Alice, in a sledge. Her Majesty and his Royal Highness were followed by the Hon. Mary Seymour, the Hon. Matilda Paget, and Lord Alfred Paget, in a second sledge. Captain the Hon. de Ros attended on horseback. Since the year 1814, when the Thames was frozen over for many miles below the bridges, so severe a winter as the present has not been known. The frost in London, including the suburbs, has been as much as from 15 deg. to 27 deg., the thermometer having ranged from 17 deg. to 5 deg. ; whilst in some parts of the country it has been as low as 6 deg. below zero, or 38 deg. below freezing-point. The Parks have presented all the appearance of a fair, the crowd consisting generally of a large proportion of the nobility and gentry. The Thames may be said to be nearly frozen over; from the immense quantity of ice above bridge. and in many places below bridge, all steam traffic, and, in fact, all navigation is suspended from Greenwich to London-bridge, and thence to Richmond. So large a quantity of thick ice has not been seen on the river for many years. During the whole of Saturday crowds of persons assembled on London-bridge and the various wharfs opposite Billingsgate-market to view the extraordinary spectacle of persons skating on the Thames near Pickle-herring-stairs. For some days previously the crews of the various vessels in the Pool had been enabled to walk across the ice to the shore ; but on Saturday the men belonging to a Dutch brig, after carefully sweeping a large area of ice, commenced skating, much to the astonishment of the spectators. The destruction of floating property on the river has been very great. 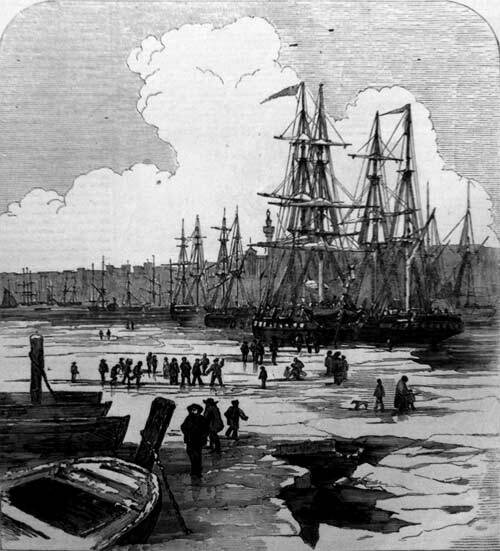 On Tuesday morning, at half-past three o'clock, two coal gigs, laden with coals, and moored off Mr. Wohlgemuth's coal-wharf, in Wapping, broke adrift from their moorings in consequence of the pressure of the ice, and carried away piles, boats, mooring chains, and everything with which they came in contact. Proceeding upwards with a strong flood tide, the two ships came in contact with Messrs. Thompson's, the coal-merchants, Barge-road, sweeping the craft laden with coals before them, sinking some and crushing others, and tearing away part of Messrs. Thompson's premises. The sides of many coal-lighters were torn off by the ice and the pressure of the ships upon them. The brigs next came in collision with the Aberdeen steam-ship Royal Victoria, of 800 tons burden, and moored off the Thames police-station. The steamer was soon carried away from her moorings—chains, anchor, and gear snapping to pieces. The piles which sustain the floating pier, and the huge floating pier and its massive timbers at the Aberdeen Wharf, were carried away. The whole was sunk below the ice, and in a few hours not a vestige of the pier was to be seen. The steamer and brigs, after overcoming the impediment, drifted towards the Newcastle Wharf, and the floating pier and piles were in an instant destroyed. The steamer and ships were carried by the tide as far as the Union• stairs pier, about half a mile from Wohlgemuth's Wharf, where they were stopped about five o'clock, when it was nearly high water. On the ebbing of the tide the three vessels floated down the river, and, having cleared all obstacles in their way up, were driven on shore at Execution Dock. Quantities of ice are reported to be drifting in the Channel, more particularly in the Downs—a circumstance which the pilots seldom remember to have witnessed. 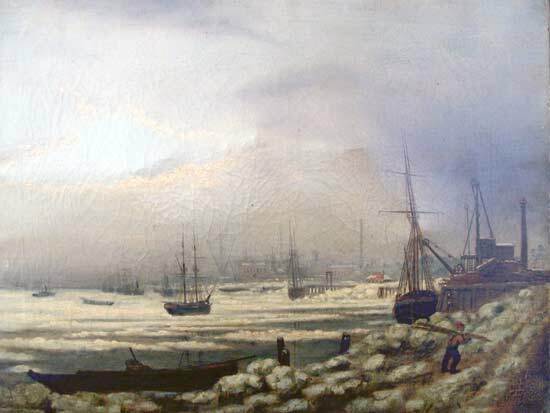 It is computed that the frost has thrown as many as 10,000 dock labourers out of employment. For the last fortnight or more, a large fleet of homeward-bound ships have been locked out in the chops of the Channel by the easterly wind, while the frozen state of the river prevents the coasters coming up to discharge at the wharfs. There is the same dearth in the arrival of colliers from the north. The wind has prevented them leaving the Tyne, Wear, Tees, &c., and in the meanwhile they have been frozen in. During the week scarcely half-a-dozen ships have entered the docks to discharge, and the trade alongside the river is almost at a standstill. to fifteen inches of firm, unbroken ice; and the rivers are in much the same state. The Downs are partially covered with large fields of floating hummocky ice, about a foot thick, upon which several parties have been walking, presenting such an appearance as has not been seen for the last sixty years or more. In Liverpool the number of corn-porters out of work is about 2000, and there are about double that number of cotton-porters and dock labourers partially unemployed; while it is estimated that the number of labourers of all kinds, in the town, who are unwillingly eating the bread of idleness, is not less than 15,000 or 20,000. When the frost disappears, however, every branch of trade will be resumed with unwonted activity. As an illustration of the extent to which the weather has interfered with the ordinary trade of the port, it is said that in place of the usual Customs receipt of from £500 to £2500, for duties on goods from the ship, the amount received from this source in one day recently did not reach £50. In the docks at Southampton, where ships have been lying for some time without being disturbed, they have become completely frozen in. In the inner dock there has been a great accumulation of fish, consisting principally of the grey mullet. Owing to the severity of the weather, these fish have become completely benumbed by the cold, rendered entirely powerless, and by the strength of the tide have been washed into the dock, where they have become an easy prey. The scene represented in the cut entitled “Skating by Torchlight,” [not shown] took place at a late hour on Thursday night week. A great number of gentlemen, not wishing to mingle with the crowd, proceeded in a body to the Serpentine after the regular skating hours had finished, and, each with a lighted torch in hand and a policeman's lamp buckled in front, amused themselves on the ice until nearly midnight. Mr. Superintendent Williams, on being informed of what was going on on the river, proceeded to the spot, and fortunately no accident took place. 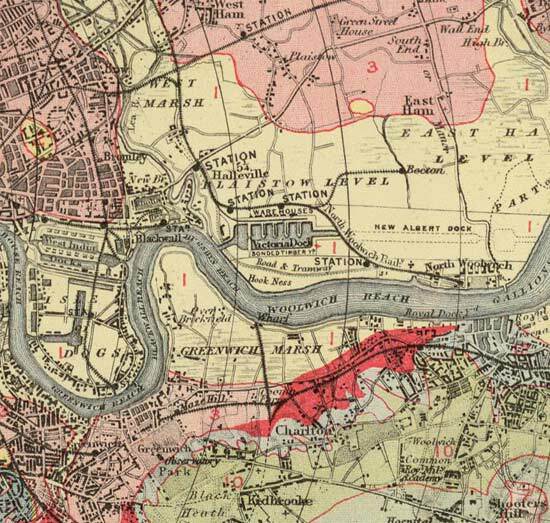 These maps of London, courtesy of the David Rumsey Historical Maps Collection, show Greenwich and Woolwich Reaches on the Thames. 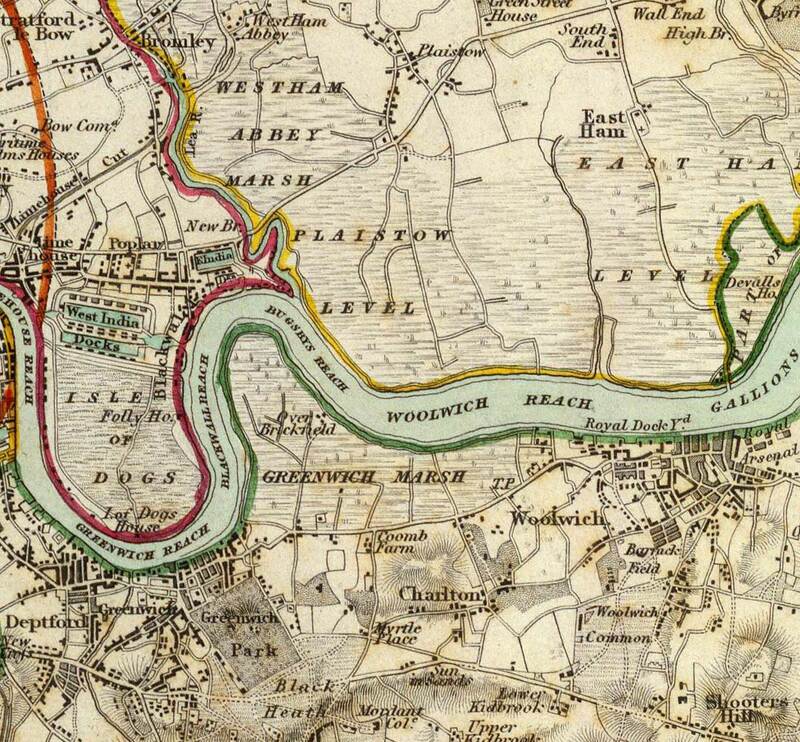 The progress of the industrial development on the Woolwich Reach between 1832 and 1901 can be clearly seen. On the south side of the Thames at Woolwich is the site of the Siemens Brothers factory, the viewpoint of Joshua Taylor's painting. Directly across the river is Silvertown, the site of S.W. 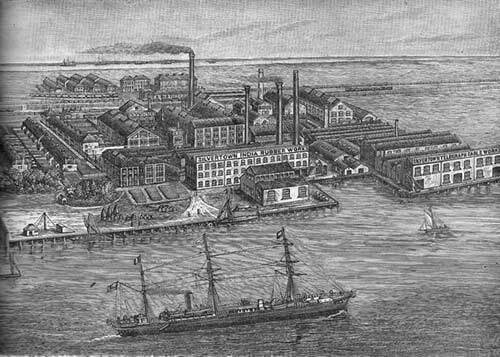 Silver's factory, later the India Rubber, Gutta Percha and Telegraph Works Company. 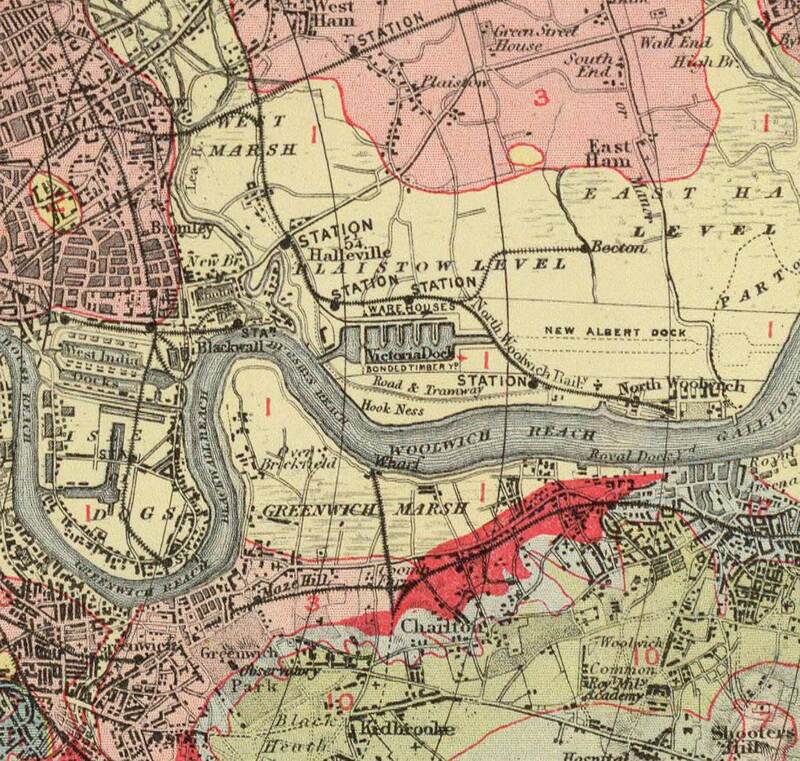 The sites are most easily located on the 1901 map, which has Silvertown clearly marked, or by using the Google map, which has placemarkers for the two factories and the Thames Barrier.